Burnley's Dwight McNeil celebrates scoring his side's first goal of the game during the Premier League match at Turf Moor, Burnley. PRESS ASSOCIATION Photo. Picture date: Saturday March 16, 2019. 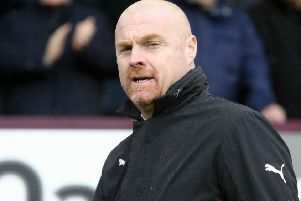 See PA story SOCCER Burnley. Photo credit should read: Martin Rickett/PA Wire. RESTRICTIONS: EDITORIAL USE ONLY No use with unauthorised audio, video, data, fixture lists, club/league logos or "live" services. Online in-match use limited to 120 images, no video emulation. No use in betting, games or single club/league/player publications. Dwight McNeil is determined to grab his England opportunity with both hands after joining his international team-mates at their base at St George’s Park. The 19-year-old was drafted in to Paul Simpson’s Under 20 squad for the first time after training with the Young Lions in October. The winger, who netted his second goal in the Premier League in Burnley’s 2-1 defeat against Leicester City at Turf Moor, was included in the 23-man group for Euro Elite League games against Poland and Portugal. McNeil was named as one of five forwards, alongside Eberechi Eze (Queens Park Rangers), Grady Diangana (West Ham United), George Hirst (OH Leuven) and Arsenal’s Eddie Nketiah. “It was a big moment for me and my family,” said the teenager. “I’m happy and hopefully I can be involved in both games against Poland and Portugal. I’m really happy to get the opportunity and hopefully I can take it. “Out wide they’ve got Grady Diangana and there’s a couple of lads from Grimsby and a couple of lads from Ipswich. “It’ll be a really good test for me. It shows that I’m not far off it. It’s a good opportunity for me to show what I can do. Many had expected McNeil’s displays in the Premier League to be rewarded with inclusion in Aidy Boothroyd’s Under 21 squad, but the teenager prefers the chance to grow through the tiers. England beat Germany last time out, when goals from Lukas Nmecha and Joe Willock secured a 2-0 win in Colchester in November, and they’ll face stern tests against their next couple of opponents. Poland will arrive with their U21 Talent ID group while Portugal are recognised as one of the best U20 teams in Europe. “I don’t mind because it’s my first trip away,” said McNeil. “I’m just trying to take it one step at a time at the minute and work my way up. I’ve just got to work from here. There are some good players in it.